Copywork is a great way to not only practice handwriting, but also learn fascinating new facts about science, history, holidays and more! SallieBorrink.com has some highly-engaging copywork packs available in print, cursive and a money-saving print and cursive combo. 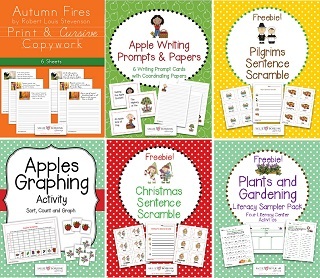 Check out their free copywork printables, free literacy printables, free math printables, free writing printables, free science printables, free Christmas printables, free Thanksgiving printables, and more! Your learners will love the facts in these packs – history copywork, geography copywork, holiday copywork, science copywork, seasons copywork and more. Just download, print and go! Here are a few fun Autumn themes to get you started!